By the time Yale University opens its new $120 million science building, more students might be able to walk out of their apartments and across the street to get to class. Newcastle President Margaret Streicker-Porres said that given the building’s location in the Whitney Avenue Historic District and its proximity to Yale’s Science Hill, the School of Management, and the Peabody, it was the kind of project that her company thought was worth undertaking. New Haven architect Fernando Pastor is spearheading the design plan, which calls for converting existing a three-bedroom apartment and its common space into two, two-bedroom apartments, and a one-bedroom into a two bedroom unit. Storage space in the basement will be converted into a three-bedroom apartment and gym space for the future tenants. 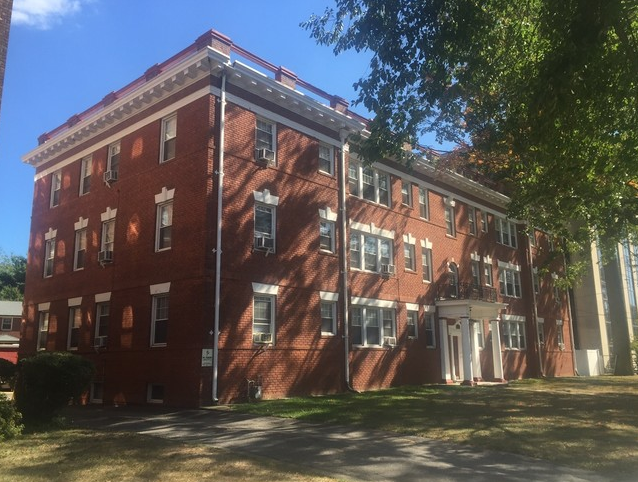 Pastor said that when Peabody Place was built in 1920 it was a built as student housing with the following configuration of apartments: three one-bedroom, four two-bedrooms, four three-bedroom apartments, and one two-bedroom for the caretaker. He said the north side of the building has one one-bedroom and one two-bedroom apartment per floor and the south side has only one three-bedroom apartment. 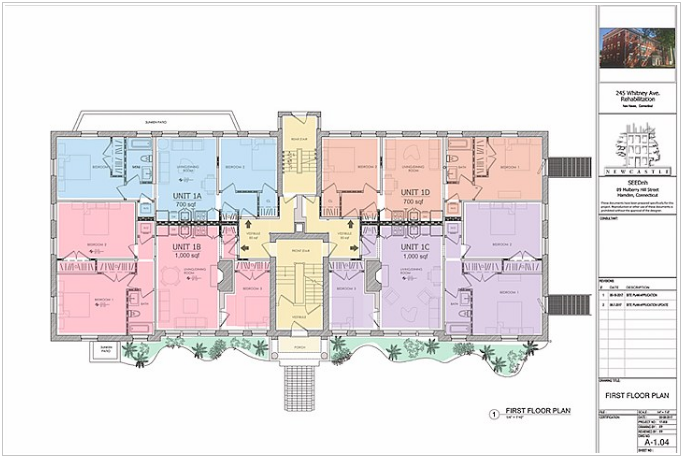 The new configuration will essentially add one apartment to every floor including the basement to create 4 additional apartments. Project Site Manager Silvia Portilla said that in the case of some of the conversions on the above basement floors, kitchens will be moved into the common spaces of the reconfigured apartments and the former kitchens will become a bedroom. Streicker-Porres said that what Newcastle discovered when it was preparing to take on the building is that it has lost the standardization that it had when it was first built. Apartments have been reconfigured in highly varying ways as amenities like closets and even faux fireplaces were added over the years. She said getting the apartments in the building back to one standard, while also upgrading a lot of the electrical wiring and other inner workings of the building is part of getting the building ready for the demands of the 21st century and beyond. All bathrooms and kitchens for each of the units also will be renovated. But there will be no expansion of the building and there will be no new structural additions. Streicker-Porres said that in addition to the interior changes, there will be some changes to the grounds that the building inhabits. The paved parking lot at the back of the building will be replaced with pavers to create more natural drainage on site for stormwater runoff, according to Pastor. There also will be all new plantings around the front of the building with native species. 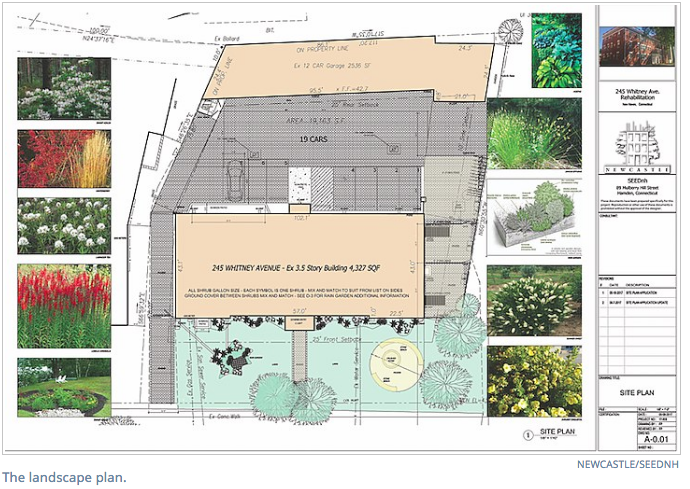 In addition to those landscape changes, there will be a rain garden and a working fire pit, and the basement apartment will get a sunken patio that doubles as a place to relax and an emergency egress. A 12-cycle bike rack also will be added to the rear parking lot. The work will get underway as the building empties out. There are four tenants left in the building with leases coming to an end this summer. Construction is expected to last approximately one year, according to City Plan Department documents. This isn’t Newcastle’s first project in the Elm City. It’s currently working on the conversion of a former church and its rectory at 847-855 State St. near the corner of Clark Street, across State from Da Legna, Christopher Martin’s, and Modern Apizza restaurants. 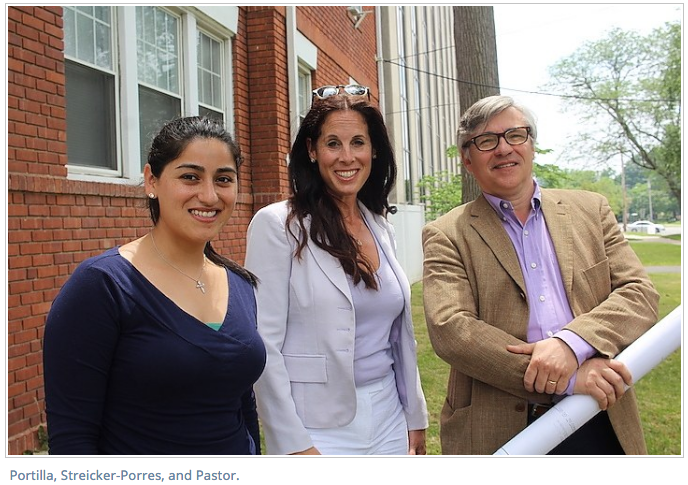 Streicker-Porres said that project is “coming along nicely,” and she the company is thrilled that the City Plan Commission approved the new project, which allos the company to participate in the ongoing revitalization of a vibrant part of the city.